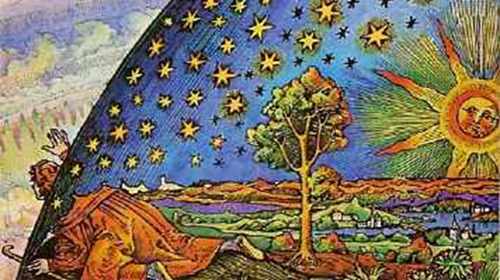 Esoterism is the study of the hidden mysteries of nature and science, which can assist an individual to develop inner knowledge of himself and the world around him. The term Esotericism is derived from the Greek word Esôterikos which means “pertaining to the innermost.” A common form of Esoteric study is the exploration of the hidden meanings and symbolism in various philosophical, historical, and religious texts, including the Bible and the Torah. The Kybalion attributes its origins to the original writings of Hermes Trismegistus, suggested to be a scribe of the Gods who dwelt in Ancient Egypt and a contemporary of the biblical patriarch Abraham. The name Trismegistus means “thrice greatest Hermes,” which was a title given by the Greeks to the Egyptian god Thoth, who was considered a lord of wisdom and learning. Instead of founding a school like many other great philosophers, Hermes taught orally as his method for passing on his wisdom and teachings. The Kybalion s tates “the lips of wisdom are closed, except to those with the ears of understanding.” By only teaching to small groups and eschewing written publications, the ancient teachers believed that the wisdom of the teachings would be protected. What is the fundamental nature of reality? The underlying teaching of The Kybalion is that everything is governed by seven universal laws. 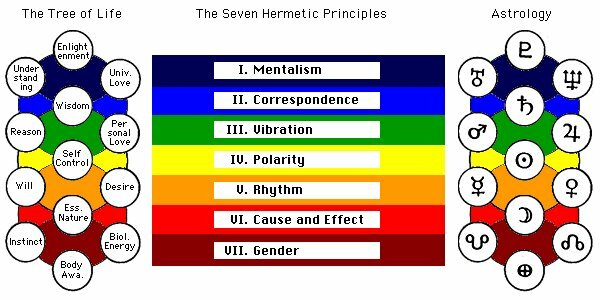 These laws are categorized in the book as the principles of mentalism, correspondence, vibration, polarity, rhythm, cause and effect, and gender. The Kybalion explains that by examining these principles and applying them to life, a scholar can gain in wisdom and understanding. The first principle explains that all reality exists within a universal, infinite, living mind. All the phenomena in the world is simply a mental creation of the All, and everything is subject to certain Universal laws. The entire known universe exists within this Mind where we live and move. The second principle states that there is a harmony, agreement, and correspondence between the Physical, Mental, Emotional, and Spiritual planes. Everything in the Universe shares the same rules and patterns. The application of this principle enables Man to reason intelligently from the known to the unknown. By studying the golden ratio on a seashell, we can learn about the structure of the Milky Way Galaxy. In utilizing the rules of Geometry, we can measure the movement of stars. The third principle states that motion is manifest in everything in the Universe. Although dense matter seems to stationary and solid, everything actually moves and vibrates. The differences between Matter and Energy are the result of only different vibrations. The All operates at an infinite level of vibration, almost to the point of being at rest. Everything operates at varying degrees of vibration. The fourth principle states that all manifested things have two sides, two aspects, or two poles. Although things may seem to be opposite, they are actually identical in nature. When extremes meet, all paradoxes may be reconciled. For example, “hot” and “cold” are simply varying degrees of the same thing, merely a variation in the rate of Vibration. The fifth principle states that in everything there is manifested a measured motion: a swing backward and forward. This flow and inflow is evidenced in ebb and flow of the tide on a beach. There is rhythm between every pair of opposites or poles. For every action, there is a reaction which can be universally applied to the planet, humans, animals, mind, energy, and matter. This law is manifest in the creation and destruction of stars or in the rise and fall of nations. Moreover, the law of rhythm is evidenced in the mental states of Man. The sixth principle states that there is a cause for every effect and an effect for every cause. Moreover, there is no such thing as chance, that chance is merely a concept applied when the causes are not recognized or perceived. While there are various levels of Cause and Effect, nothing escapes the Law entirely. The seventh principle states that gender is manifested in everything. Gender is described as the masculine and feminine principles found within everything. This principle directs generation, regeneration, and creation. The Kybalion teaches that every person contains masculine and feminine within themselves. In the study of Esoteric texts such as The Kybalion, an individual can gain great insights into themselves and the world around us. Freemasonry assists each member in the work of self-improvement, which can be greatly enhanced by understanding the nature of our reality. Studies in quantum mechanics illustrate a phenomenon called “the observer effect,” which is that what the observer thinks is going to happen during an experiment impacts the results. This is an example of the Principle of Mentalism as the thoughts of the scientist influence what is physically measurable, drawing a clear relationship between how the mind impacts the physical world. If a person’s thoughts have a real effect on the state of reality, each person is called to the task of self-improvement. Freemasonry’s goal of “making good men better” can make a real difference in improving our world and all of humanity. How can one begin to study the kabbalah in a practical way? Are there resources for self-study or groups? Are there good resources for self-study of the kabbalah for practical purposes? Or, how does one find a teacher? For those interested in studying The Kybalion, below is the link to purchase the book on Amazon. Use this. The Hermeticron was written with The Kybalion in mind. It is free online at this group or as a paperback.